It was conferences this week at school. That means the girls had half days, (more like super short 2.5 hour days) and we had some extra time on our hands in the afternoons to have a little fun. We came across these Halloween inspired chocolate chips at the grocery store, and thought we could do something creative with them. We succeeded! Ooo spooky fun PURPLE cookies! 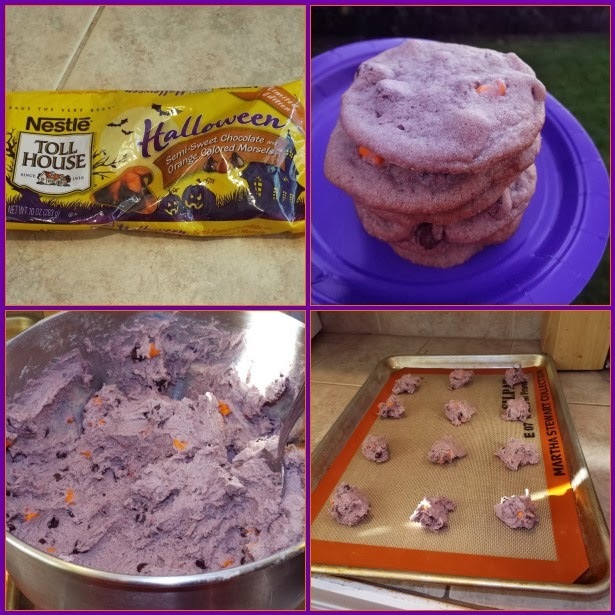 We had only just started whipping up our regular cookie recipe: the Nestle Toll House one on the back of the bag (with 2 small alterations which I will share in a moment), when my oldest suggested we dye the cookie dough orange or purple. We went with purple! I, myself, who has loved making rice krispie treats all the colors of the rainbow from my teenage years on up, had never once in my whole life, ever thought to dye chocolate chip cookie dough. ...And a child shall lead them... Genius! Nothing more perfect to bring out the orange and black colors in the chocolate chips than amping them up with that other fun Halloween color of purple! Here are the chips. We found them in the baking aisle or sometimes they will have a holiday baking section in the grocery store. The orange colored chips are actually orange flavored, and the others are the regular semi-sweet. The orange chips add a nice flavor to the cookie! Then we plopped them on the cookie sheet as normal. Oh I guess I do one MORE thing different in the cooking department as well. When I use these sturdy half sheets pans with the handy dandy silpat mats (love them!! ), I will bake these at 350º for 13 minutes exactly. The original recipe calls for 375º for 10 minutes but I was tired of brown edges and soft centers. With the lower temp of 350º and the slightly longer bake time and they came out perfect for us. After that all you need is a nice cool glass of milk and a stack of your purple spooky treats to enjoy. The neon color dye made this a light purple shade. I'd love to try it again with a few drops of regular red and blue to attempt a darker shade. See what I mean? I don't know if you've ever seen a sting ray before up close, but they are huge, glide-y... almost alien-esque. Some of these above are as big as dinner tables, and although we were told they were friendly and snugly like "big cats"... All I could think about were they were over-sized wasps with killer tails. Did I mention I kissed one?? I was told it was 7 years of good luck if you do. Sure.. I look "happy" in this picture... but would you believe I'm terrified!? 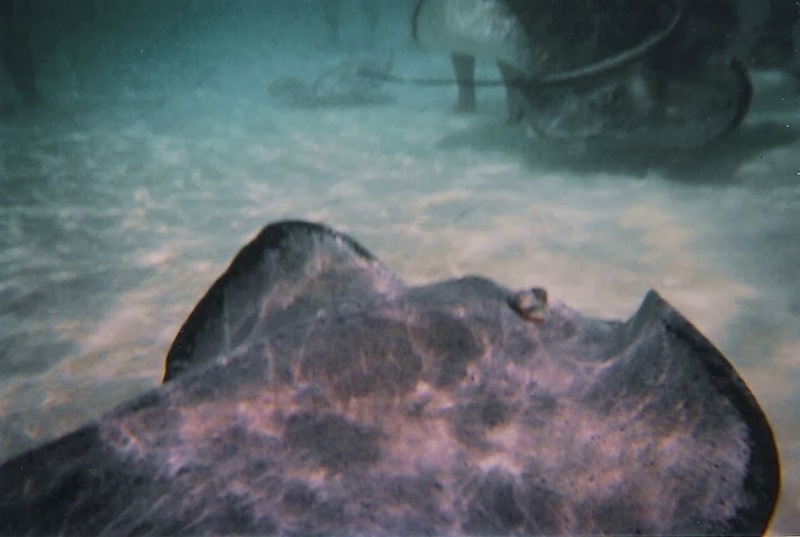 Standing chest deep on a sandbar with ocean currents knocking you over and your last known instructions were "do NOT STEP ON OR SWIM OVER A STING RAY"... careening through your head... Right after this pic I high-tailed it back to the boat, having to navigate past 12 other huge stings rays just to make it back safely. Why did I go off on this crazy sting ray tangent just now? Because sting rays scare the crap out of me, and purple chocolate chip cookies oddly now remind me of them. Especially Halloween themed cookies, which should be scary too! All in all it was a fun way to slightly change up a regular cookie baking afternoon with some newfangled chips and some revolutionary fun cookie dough colors. I have to thank my 8 year old for the inspiration.